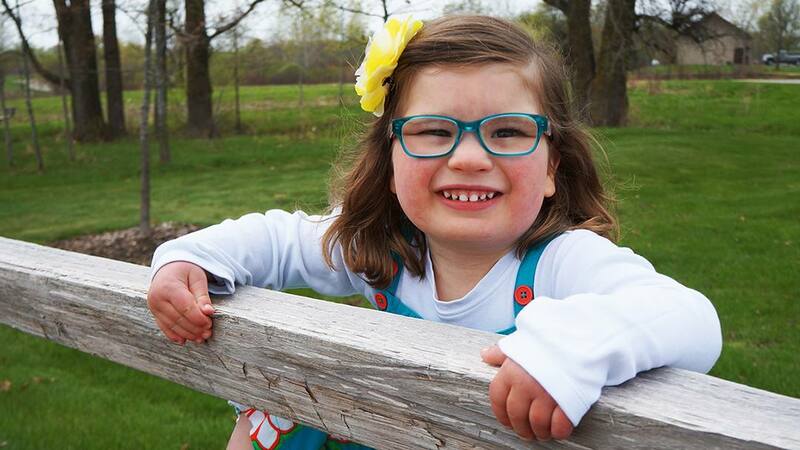 Affected by a rare genetic condition that can cause developmental delays, Vera Johnson is happy and thriving in the world her parents have built for her with support from her Mayo Clinic team. For 4-year-old Vera Johnson and her parents, the simple things in life bring the most joy: swinging in the backyard, digging in the sandbox, playing with Maizy, the family dog. These activities fit snugly into the secure world Becca and Mychal Johnson have created for their daughter. Those comforting routines serve as a balance against the complex, multisystem disorder that affects Vera's health. Diagnosed with mitochondrial disease when she was 2 months old, Vera was beset by medical issues during her first weeks of life. In addition to mitochondrial disease, Vera had a severe heart defect. That defect was discovered before Vera was born, and Becca and Mychal, who lived in Bemidji, Minnesota, at the time, were given a choice about where they could receive high-risk prenatal care. They chose Mayo Clinic. That choice led to other discoveries. "We were so thankful that Vera had this heart defect. Because if she'd never had it, I don't know where we would've landed or how quickly she would have been diagnosed," Becca says. "With mitochondrial disease, early diagnosis is key. As hard as it is to say, we find her little heart to be a blessing because it got us here." Today, with the advocacy of her parents and support of her Mayo Clinic care team, Vera swims, rides a bike, knows her numbers and letters, and attends preschool (as cold and flu season allows). Her development far exceeds her health care providers' initial expectations. "The first time I met them, Vera was in the ICU. We didn't think she was going to make it, so she's really come a long way," says Deborah Renaud, M.D., Vera's Mayo Clinic neurologist. "She's way ahead of a lot of kids with mitochondrial disease, and so I am very proud of her." In 2014, when Vera's heart condition first was discovered in utero, ultrasound imaging did not reveal the precise defect. Becca and Mychal were told that their daughter's aorta was either completely disconnected from her heart, a condition called interruption of the aorta, or the blood vessel was simply too narrow, a condition called coarctation of the aorta. Because both conditions require surgery, Becca's physicians in Mayo Clinic's Division of Maternal and Fetal Medicine asked her to move to Rochester before she was 37 weeks pregnant to prepare for labor and delivery. Shortly after her birth, on March 17, 2014, Vera was transported to the Newborn ICU at Mayo Clinic Hospital — Rochester. Four days after that, neonatal surgeons corrected Vera's heart defect, which turned out to be coarctation. With the surgery behind her, Vera likely could be weaned from breathing support in days and sent home with her parents in two weeks, according to her physicians. "But for some reason, Vera just really had a hard time coming off the ventilator," Becca says. What's more, Vera developed lactic acidosis, a condition that occurs when the body has a problem metabolizing lactic acid. "I will never forget Vera’s heart surgeon running up five flights of stairs from the OR because he heard Vera was very ill,” Mychal says. “It was one of the scariest days, and we knew something wasn’t adding up." Two weeks after surgery, Vera's breathing finally stabilized, and she was removed from the ventilator. But after that advance, eating became a problem for Vera, and she was unable to keep anything down. As a result of recurrent vomiting and a severe oral aversion, she received a gastric feeding tube. Vera started to improve after that. In mid-May, two months after her birthday, the infant was discharged from the hospital. Becca and Mychal's relief about Vera's release, however, quickly dissipated. On their car trip home to Bemidji, Vera developed diarrhea. Becca kept the team at Mayo Clinic abreast of the situation. The next few days saw Vera in and out of her pediatrician's office. On the fifth day of sickness, Vera's symptoms were worsening, and her parents brought her to the local emergency department. It was quickly determined that she was severely dehydrated. As Vera's vital signs began to fall, her hometown care team called Mayo Clinic, and a Mayo One Airplane air ambulance medical team was dispatched to bring her back to Rochester. "Before we were flown, she was back on the ventilator, and she had all of these teams coming in trying to figure out why she got so sick so fast," Becca says. "She was just this little puzzle. It was beyond terrifying." Back at Mayo Clinic Hospital, Vera was admitted to the Pediatric ICU. Then Vera's condition became even more complicated. She began having seizures. At that point, staff from Neurology joined the team. Dr. Renaud, who specializes in metabolic genetics, was the neurologist on duty when the consult was requested. Vera's medical history helped the team quickly land on a diagnosis that explained her many symptoms. "When Vera first presented, the thing that gave the intensivist and myself a clue was we saw that she had elevated lactic acid," Dr. Renaud says. "It made me think, 'This is a mitochondrial disorder.' When the mitochondria are not working well, the body can produce lactic acid in an attempt to compensate." A progressive condition that can be caused by defects in one of more than 100 genes, mitochondrial disease occurs when there's a disruption in the function of the body's mitochondria. Mitochondria, the energy-producing structures in cells, play a role in all of the body's functions. They are integral to energy-consuming activities, such as digestion, endocrine function, brain function, pulmonary function and gross muscle movement. When a person with mitochondrial disease develops an illness, particularly one requiring an increase in energy demand, an imbalance occurs between the amount of energy that's produced and the amount needed to fight the illness. "That's why these kids get into big trouble when they get the flu," Dr. Renaud says. "They don't have the resources to make the energy needed to fight it off." While Vera's parents and medical team waited for genetic testing results to confirm the diagnosis, Vera began receiving a vitamin cocktail that counters metabolic deficiencies caused by mitochondrial disease and helps the mitochondria produce more energy. That helped stabilize her. After that, Becca remembers being given the green light by Vera’s intensivist to hold her for the first time since the baby had returned to the hospital. At the time, Vera had a very low heart rate. But when being held by her mother, Vera’s heart rate went up. "What a difference it made for her and for us as parents getting to hold her," Becca says. "A child needs to feel love and touch to be able to grow and learn." To her parents' relief, Vera was soon taken off the ventilator and became more alert. During her recovery, Vera underwent an MRI, which revealed brain abnormalities consistent with mitochondrial disease. She also had blood clots from being so dehydrated. "Her brain damage was in the basal ganglia, which is where movement comes from," Becca says. "The doctors tell you that babies' brains are like plastic, and the brain can compensate if there is damage in one area. But we didn't know how things were going to pan out for her. It was devastating." With continued nutritional, vitamin and medication support, Vera became even more alert. She was transferred out of intensive care and weaned off sedation medication. A few weeks later, with her symptoms under control, Vera's physicians said she was ready to go home. Vera's parents, however, were not. "It was terrifying — after what had happened," Becca says. "I was not ready to go, but they were ready for her to go. So they had a psychologist come and talk to me. He talked to me about my fears and how to cope with them. We had experienced a lot of trauma during the first few months of Vera’s life. He was so helpful, and we were out the door a few days later with our baby." "That Vera's parents have been extremely proactive in managing Vera's treatment and lifestyle has been a huge boon to their daughter." — Deborah Renaud, M.D. Some of Becca's main fears rested in familiarizing herself with and trusting a hospital and care team that was not Mayo Clinic. The couple quickly realized that the surest way to allay their anxiety about Vera's medical care was to move closer to the place they trusted most. 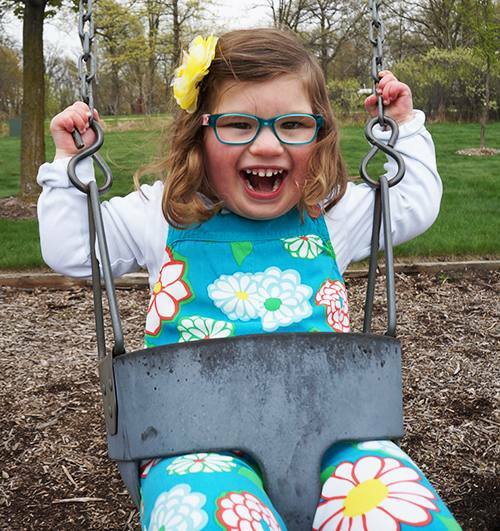 "After the diagnosis of mitochondrial disease, we knew that Vera would be hospitalized when she became ill, and we didn't want her being transported to Mayo often," Becca says. "To normalize our life, we made the decision to move to Rochester, and it has made our life so much easier." "That Vera's parents have been extremely proactive in managing Vera's treatment and lifestyle has been a huge boon to their daughter,” Dr. Renaud says. "With Vera, the nice thing is that by being very aggressive with the vitamins, maintaining her nutrition and preventing infection by keeping her out of school when kids are sick, we've been able to give Vera a lot of skills and stay very healthy." The medical home the family has found at Mayo Clinic has provided Vera with a continuum of care that's fostered a normal childhood. "When Vera was a baby, we didn’t know what her life was going to look like. We didn't know if she would ever walk or talk, and she is doing everything. Until she shows us that she cannot do something, we're going to try," Becca says. "We cherish every day with our happy, smart and adorable Vera. She is a gift, and she has taught us so much about life." Read more about mitochondrial disease and learn more through the United Mitochondrial Disease Foundation.